Your very first trip as a married couple is an important one, so it must be extra special! Deciding where to go is part of the fun – but can be stressful. Below we give you 5 reasons to honeymoon in St. Lucia. No matter what part of St. Lucia you visit, you are bound to find a gorgeous beach. Visit Pigeon Island for a sheltered, picturesque beach with endless golden sand. Or make time to see Anse Cochon, an unspoilt beach set right up against the rainforest. Here you can enjoy snorkelling or kayaking on the calm waters. Anse des Pitons, or Sugar Beach, is another spectacular beach with silver sand, imported from Guyana, plus uninterrupted views of the striking Pitons. In addition to stunning beaches, you will also find lush rainforests, botanical gardens, waterfalls, and sulphur springs throughout St. Lucia. The island prides itself on this natural beauty, so much that there are ongoing conservation efforts to keep the land looking exactly as it is. Couples-only resorts are perfect for romance and relaxation. If that is what you and your soon-to-be spouse are looking for, then St. Lucia is the perfect destination for your honeymoon. Enjoy your special trip without the distraction of kids, families, or groups of rowdy friends. All-inclusive resorts are great for honeymoons, and there are plenty to choose from on the island of St. Lucia. If you want more than just relaxation at your resort, however, then St. Lucia is a great option for you. You can go hiking in the mountains, hike the Enbas Saut waterfall trail, go horse riding, zipline through the trees, or enjoy a day in the fishing village of Soufriere. 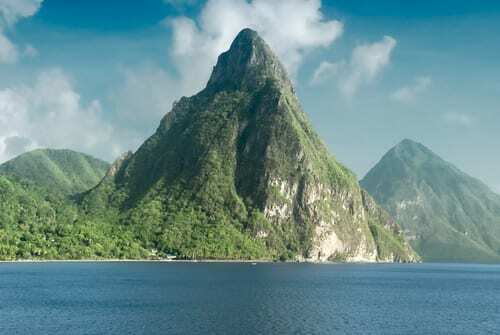 The Piton Mountains are a symbol of the natural beauty in St. Lucia. These twin peaks are around 300,000 years old. Visit Soufriere for the best spot to gaze on both peaks, or stay at a resort such as Jade Mountain which has an unbeatable view. Call Enchanted Honeymoons Travel at 402-281-3022 today to start planning your romantic getaway!